The organizers of the Researching New York Conference invite proposals for panels, papers, workshops, roundtables, exhibits, and documentary and multimedia presentations on any aspect of New York State history —in any time period and from any perspective. The conference will be held at the University at Albany on November 15-16, 2012. This annual conference brings together historians, archivists, graduate students, public historians, documentarians, and multimedia producers, to share their work on New York State history. Nature, science, and technology are reflected in the fabric of the State’s economy, public policy, and culture—and in the lives of its citizens. Environmental forces and human histories have long been intertwined. Among many concerns, policymakers today consider the implications of energy, light rail and nanotech research, while their predecessors sought to develop the economy of the state with infrastructure projects like the Erie Canal, the New York State Thruway, agricultural experiment stations, housing projects, and much more. For 2012, the organizers especially encourage submissions that call attention to transformations of the New York state landscape, while exploring historic ways of knowing and understanding the environment and the broader social, cultural, and political implications of technological and environmental transformations. The proposal deadline is July 1, 2012. Complete panels, workshops, media presentations, or sessions are preferred- partial panels and individual submissions will be considered. For complete sessions please submit a one-page abstract of the complete session and a one-page abstract and curriculum vita for each individual participant. For individual submissions, submit a one-page abstract and one-page curriculum vita. Submissions must include name, address, telephone number, and e-mail address. Submit electronically to resrchny@albany.edu. All proposals must detail any anticipated audiovisual needs or time constraints at the time of submission. The organizers also seek commentators for panels. Please indicate your interest by contacting us at resrchny@albany.edu, noting your area of expertise and including a one-page vita. The organizers of the 14th annual Researching New York Conference invite proposals for panels, papers, workshops, roundtables, exhibits, and documentary and multimedia presentations on any aspect of New York State history -in any time period and from any perspective. Researching New York brings together historians, archivists, museum curators, graduate students, teachers, documentarians, and multimedia producers, to share their work on New York State history. Presentations that highlight the vast resources available to researchers, as well as scholarship drawn from those resources, are encouraged. This year’s conference will be held November 17th & 18th, 2011 at the State University of NY at Albany. Anniversaries are a means to recall, celebrate, or commemorate significant milestones in history. Often forgotten is what came next. Examining the aftermath of momentous events in both the short and long-term enlarges historical understanding, whether viewed from a political, cultural, social, legislative, or other perspective. 2011 marks a number of anniversaries: 9/11, the Attica Prison Uprising, the Triangle Shirtwaist Factory Fire, and the beginning of the Civil War, among others. For Researching New York 2011 we encourage submissions that not only explore how we remember, commemorate, and create meaning from these and other notable events in New York State history, but that also consider what came next. anticipated audiovisual needs or time constraints. All conference participants are expected to register for the conference. They also seek commentators for panels. If you would like to comment on a panel, please contact us at resrchny@albany.edu, indicating your area of expertise, along with a one-page vita. For additional details and future conference updates, visit the Researching New York website. 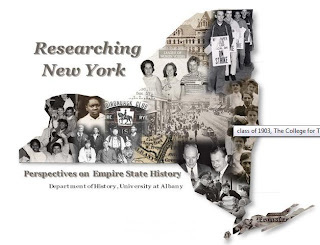 Researching New York is sponsored by the University at Albany History Department and History Graduate Student Organization and the New York State Archives Partnership Trust. Researching New York: Perspectives on Empire State History, an annual conference that provides a forum for the exploration of all aspects of New York State history, in all time periods and from diverse perspectives, will be held this Thursday and Friday, November 18th and 19th. The conference brings together historians, researchers, archivists, public historians, librarians, teachers, museum curators, filmmakers, and documentary producers — all to share their interest and their work in New York State History. the vast resources available to researchers as well as the scholarship drawn from those sources. additional cost, you must reserve a space when you register. For conference updates, directions, maps, and information about local hotel accommodations, visit the Researching New York website. Conference registration is $50.00 including all featured events, lunch and receptions. Advance registration is requested. Please be sure to include your name, institutional affiliation, and e-mail address with your check and also note if you would like to reserve a seat on the bus to the Museum. Send any questions or comments to resrchny@albany.edu. The organizers of the 12th annual Researching New York Conference invite proposals for panels, papers, workshops, roundtables, exhibits, and documentary and multimedia presentations on any facet of New York State history -in any time period and from any perspective. The conference will be held at the University at Albany on November 18th and 19th, 2010. Researching New York brings together historians, archivists, museum curators, graduate students, teachers, multimedia producers, and documentarians to share their work on New York State history. Presentations that highlight the vast resources available to researchers, as well as scholarship drawn from those resources, are encouraged. For Researching New York 2010, we especially invite proposals that examine and explore the myriad ways that technology has changed how we &#8220do&#8221 history from research to preservation, from classroom teaching to museum exhibits, from on-site to virtual audiences and so much more. Proposals are due by June 28, 2010. Complete session proposals, workshops, roundtables, film screenings, and media presentations are preferred. Partial panels and individual submissions will be considered. For panels and full proposals, please submit a one-page abstract of the complete session, a one page abstract for each paper or presentation, and a one-page curriculum vita for each participant. Individual submissions should include a one-page abstract and one-page curriculum vita. Submissions must include name, address, telephone number, and e-mail address. Please submit electronically to resrchny@albany.edu. All proposals must detail any anticipated audio visual needs. The organizers are also soliciting commentators for panels. If you would like to participate as a commentator, Please send a note to resrchny@albany.edu indicating your area of expertise, along with a one-page vita. Researching New York is sponsored by: The Department of History and the History Graduate Student Organization, University at Albany, SUNY and The New York State Archives Partnership Trust. The annual Researching New York Conference, entitled 400 Years of Exploration: The Hudson &#8211 Champlain Corridor and Beyond, will take place today and tomorrow (November 19th and 20th). What follows is the conferences free and open to the public featured events, and even those who cannot attend the conference will find the Thursday evening sessions at the State Museum, as well as the Friday plenary session, interesting. Both those events are free and open to the public. The full conference program is available in the History Department and at http://nystatehistory.org/researchny/rsny.html. Questions may be directed to resrchny@albany.edu. UAlbany student/faculty registration for the entire conference and the lunch is $20.00. display- staff from both institutions will be available to give overviews of their collections and answer questions. Limited to 30 people, registration requested. Call (518) 408-1916 to reserve a spot. Walk-ins are welcome if space is available. Library staff will demonstrate navigating the Library’s website, http://www.nysl.nysed.gov/research.htm, including the services and electronic resources available to researchers. Sheldon Wein and Cara Janowsky will also demonstrate how to find and access items in the Library’s digital collections. Limited to 19 people, registration requested. Call (518) 474-2274 to reserve a spot. Walk-ins are welcome if space is available. The scholars and museum professionals who were integral in the creation of these exhibits will lead talks in the respective galleries. the New York Academy of History, new public school curricula, and more-as he challenges us to look to the future of New York’s history. The discussion will be moderated by Jeffrey Cannell, Deputy Commissioner for Cultural Education, New York State Department of Education. For 400 years European and American explorers &#8211 from Henry Hudson to modern urban tourists &#8211 have traveled through the Hudson Valley. Stradling examines how the perceptions of these explorers have influenced public policy, especially preservation and conservation, in an attempt to explain why this heavily populated region still appears to be so wild. His publications include Making Mountains: New York City and the Catskills and Smokestacks and Progressives: Environmentalists, Engineers, and Air Quality in America, 1881-1951.
the bridge and the NYS Thruway extension. Funded in part with a &#8220Preserve America&#8221 grant from the Federal Parks Service in partnership with the County of Rockland, and Rockland County Tourism, the film is a part of the larger Tappan Zee Project of the Historical Society of Rockland County, which also includes teacher’s guide, museum exhibition, and companion book. story of this historic bridge and how it brought both immigration and heritage tourism to Rockland County-and is part of the larger story of suburbanization in America. The Project also offers a window into the value of local historical collections, innovative public history projects, and ways to tell stories from the archives. The deadline for submitting proposals for the Researching New York Conference has been extended to July 10th. The organizers of the annual Researching New York Conference invite proposals for panels, papers, workshops, roundtables, exhibits, documentary, and media or multimedia presentations on any facet of New York State history -in any time period and from any perspective. The conference will be held at the University at Albany, Albany, New York, on November 19th and 20th, 2009. We especially invite proposals that explore and interpret not only the exploits of Henry Hudson and Samuel de Champlain, but the many kinds of exploration that have taken place in the ensuing 400 years of New York State’s rich and diverse history-including consideration of how we remember, celebrate, interpret, and commemorate historical events. We are also soliciting commentators for panels. If you would like to participate as a commentator, please send a note to resrchny@albany.edu indicating your area of expertise, along with a one-page vita. Researching New York brings together historians, researchers, archivists, museum curators, librarians, graduate students, teachers, Web and multimedia producers, and documentarians to share their work on New York State history. 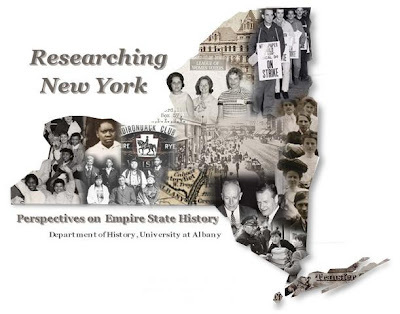 Presentations that highlight the vast resources available to researchers of New York State history, as well as scholarship drawn from those resources, are encouraged. Proposals are due by July 10, 2009. Full panel proposals, workshops, roundtables, exhibits, film screenings and media presentations are welcome. Partial panels and individual submissions will be considered. For panels and full proposals, please submit a one-page abstract of the complete session, a one page abstract for each paper or presentation, and a one-page curriculum vita for each participant. Individual submissions should include a one-page abstract and one-page curriculum vita. Submissions must include name, address, telephone number, and e-mail address. Please submit your proposal electronically to resrchny@albany.edu. All proposals must note any anticipated technology or audio visual needs. If you have any questions or comments, please contact us at resrchny@albany.edu. Further details and program updates will be available at http://nystatehistory.org/researchny. Researching New York is sponsored by the Department of History and the History Graduate Student Organization, University at Albany, SUNY and the New York State Archives Partnership Trust with support from the M.E. Grenander Department of Special Collections & Archives, University at Albany Libraries. Founded by history graduate students, Researching New York, an annual conference on New York State History, is one of the major endeavors of the History Graduate Student Organization and the History Department. This is a great opportunity for graduate students to present a paper on ANY aspect of New York State history. paper or panel is accepted shortly thereafter. You can see previous programs at the Conference Web site, http://nystatehistory.org/researchny. The organizers of the 11th Annual Researching New York Conference invite proposals for panels, papers, workshops, roundtables, exhibits, documentary, and media or multimedia presentations on any facet of New York State history&#8211in any time period and from any perspective. The conference will be held at the University at Albany on November 19th and 20th, 2009.
years of Exploration: the Hudson-Champlain Corridor and Beyond. We especially invite proposals that explore and interpret not only the exploits of Henry Hudson and Samuel de Champlain, but the many kinds of exploration that have taken place in the ensuing 400 years of New York State’s rich and diverse history-including consideration of how we remember, celebrate, interpret, and commemorate historical events. Researching New York brings together historians, researchers,archivists, museum curators, librarians, graduate students, teachers, Web and multimedia producers, and documentarians to share their work on New York State history. Presentations that highlight the vast resources available to researchers, as well as scholarship drawn from those resources, are encouraged. Proposals are due by June 28, 2009. Full panel proposals, workshops, roundtables, exhibits, film screenings and media presentations are welcome. Partial panels and individual submissions will be considered. For panels and full proposals, please submit a one-page abstract of the complete session, a one-page abstract for each paper or presentation, and a one-page curriculum vita for each participant. Individual submissions should include a one-page abstract and one-page curriculum vita. Submissions must include name, address, telephone number, and e-mail address. Please submit electronically to resrchny@albany.edu. All proposals must note any anticipated audio visual needs. The 10th annual Researching New York Conference will be held at the University at Albany on November 20th and 21st, 2008. 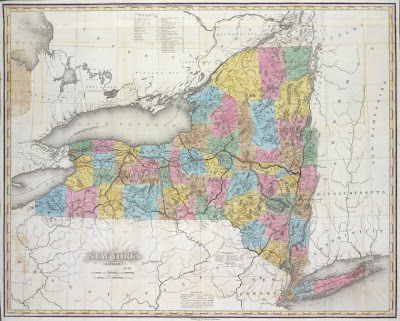 The Conference organizers have extended the deadline for proposals for panels, papers, workshops, roundtables, exhibits, documentary, and media or multi-media presentations on any facet of New York State history. Proposals are now due by until Tuesday, July 15, 2008. Researching New York brings together historians, researchers, archivists, public historians, librarians, graduate students, teachers, Web site creators, filmmakers, and documentarians to share their work on New York State history. Presentations that highlight the vast resources available to researchers, as well as scholarship drawn from those resources, are also sought. To mark the upcoming 60th anniversary of the establishment of the state university system, the State University of New York, we especially welcome proposals that explore any aspect of education in New York State-formal and informal, in public and private institutions, in the development of public policy, and in schools and communities throughout the New York State. While all aspects of New York history are welcome, submissions that explore this long, rich, and diverse history from any perspective and in any time period are encouraged. Full panel proposals, workshops, roundtables, exhibits, film screenings and media presentations are preferred. Partial panels and individual submissions will be considered. For panels and full proposals, please submit a one-page abstract of the complete session, a one page abstract for each paper or presentation, and a one-page curriculum vita for each participant. Individual submissions should include a one-page abstract and one-page curriculum vita. All submissions must include name, address, telephone number, and e-mail address. All proposals must clearly state any anticipated technology needs or scheduling considerations. If you would like to serve as a commentator for a panel, please send a note to the organizers indicating your area of expertise, along with a one-page vita.